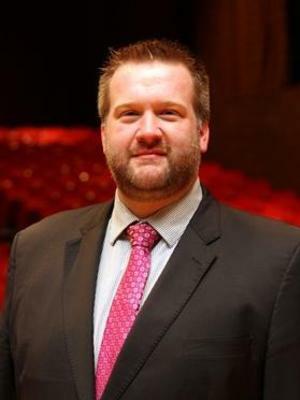 C. Andrew Blosser, a native of Belle Center, Ohio, has performed roles in opera and musical theatre, and presented master classes and recitals throughout the United States, Austria, Hungary, Poland, Germany, Czech Republic, and Switzerland. Blosser received a bachelor of music in vocal music education from the Conservatory of Music at Capital University, a master of music in voice performance and a doctor of musical arts degree from The Ohio State University. Dr. Blosser has been a featured soloist with the Columbus Symphony Orchestra, Lakeside Symphony, Tuscarawas Philharmonic, South Eastern Ohio Symphony Orchestra, and the Lancaster Festival Orchestra for concert and oratorio performances. Blosser performed Ralph Vaughn Williams’ On Wenlock Edge with the Carpe Diem String Quartet as part of the Marble Cliff Music Festival, Handel’s Messiah with the Columbus Symphony Orchestra under the direction of Ronald Jenkins, and was the soloist for the world premiere performance of Te Deum, by British composer Patrick Hawes, at the Lancaster Festival. In the summer of 2013, Blosser served as cantor for services at the Berlin Cathedral, as well as the soloist for the Mozart Missa Longa at the Salzburg Cathedral. He most recently performed on the recital Singing Our History, a chronological story of American history told through the works of American composers at the National Association of Teachers of Singing conference in Boston, Massachusetts. Blosser currently serves as a senior lecturer at The Ohio State University, where he teaches applied voice, voice literature, opera history, and diction courses. Prior to this appointment, Blosser served on the faculties of Terra State Community College, Ohio Christian University, Capital University, and Muskingum University. Blosser holds professional memberships with the National Association of Teachers of Singers (NATS), the Ohio Music Education Association (OMEA), the American Choral Directors Association (ACDA), Pi Kappa Lambda Honor Society, and Phi Mu Alpha.